As I've said before, my kiddos are really enjoying Yoursphere. One of the features they both really like is the contest page. Yoursphere offers all sorts of contests from identifying objects to photo contests. Kids can win gift cards to some of their favorite stores. both my children have really enjoyed participating in the contests Yoursphere offers. Some of their friends have even won, so that gives them hope that they might as well. The contests are easy to participate in and the rules are very easy to understand. So, if your children are on Yoursphere, you might encourage them to check the contests out! Just a reminder, Yoursphere is completely free to use. If you and your kiddos would like to check it out for yourselves, please sign up with code: YSMC-0049 and let them know Ramblings of a Texas Housewife sent you. 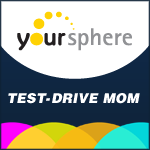 I wrote this review while participating in the Yoursphere Test Drive program by Mom Central on behalf of Yoursphere. I received a free lifetime Gold membership on Yoursphere.com, Yoursphere t-shirts, and a $50 American Express gift card to facilitate my review.